A leading cardinal has urged Christians to take legal action against the best-selling book The Da Vinci Code, and the forthcoming film adaptation. Cardinal Francis Arinze, who was among the favourites to become the new pope last year, spoke out in a TV documentary due to be shown in Rome. "Christians must not just sit back and say it is enough for us to forgive and to forget," said Arinze. "Sometimes it is our duty to do something practical." The documentary, The Da Vinci Code - A Masterful Deception, was made for the Catholic film agency, Rome Reports. "This is one of the fundamental human rights - that we should be respected, our religious beliefs respected, and our founder Jesus Christ respected," said Cardinal Arinze. "Those who blaspheme Christ and get away with it are exploiting the Christian readiness to forgive and to love even those who insult us. "There are some other religions which if you insult their founder they will not be just talking." Arinze did not specify what legal action should be taken. The Dan Brown novel, which has sold more than 40 million copies worldwide, explores the theme that Jesus has living descendants. It alleges that Catholic group Opus Dei covered up the truth about Christ's bloodline. "Any film produced on the basis of that book is already in error from the word go, no matter how interesting it might appear," said Arinze. 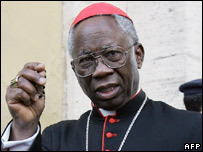 Arinze's comments follow remarks made by another Vatican cardinal, Angelo Amato, who urged a a boycott of the film adaptation last month. The film, starring Tom Hanks and Audrey Tautou, will receive its premiere at the Cannes Film Festival later this month. Leading UK Catholics and members of Opus Dei have formed a group to respond to the negative impact it is expected to bring. They have also requested a disclaimer be put in the film. Studio Sony has insisted the movie is a work of fiction and is "not meant to criticise any group, religious or otherwise", a spokesman said in February.